The article gives a description of the spontaneous hybrid Acer platanoides L. × A. truncatum, Bunge revealed during introductions research in the Botanical Garden of SFedU. The prerequisite for the emergence of closely related hybrids was the use of the method of genus complexes in the creation of a collection. Interspecies hybrids are detected in polymorphic genera: Acer, Berberis, Corylus, Crataegus, Lonicera, Sorbus. The economic interest is represented by a spontaneous hybrid A. platanoides × A. truncatum. The following are given: morphological description of the hybrid and parental species, their basic ecological and biological properties (winter hardiness, drought resistance, resistance to diseases and pests, seeds reproductive capacity), seasonal development rhythm, characteristics of seeds and decorative qualities. Aleksandrova, M. S., Bulygin, N.E., & Voroshilov, V.N. (1975). Metodika fenologicheskikh nablyudeniy v botanicheskikh sadakh USSR [The methodology of phenological observations in the botanical gardens of the USSR]. Publishers of the Main Botanical Garden of the Academy of Sciences of USSR, Moscow (in Russian). Chichev, A.V. (1981). Sinantropnaya flora goroda Pushchino. In: Ekologiya malogo goroda [The synanthropic flora of the city of Pushchino. In: Ecology of the small town]. NTSBI, Pushchino, 18-42 (in Russian). Flora Nizhnego Dona (1984). [Flora of the Lower Don]. Izdatel'stvo Rostovskogo universiteta, Rostov-on-Don, 1: 225-226 (in Russian). GOST 13056.6-97. (1998). Semena derev'ev i kustarnikov. Metod opredeleniya vskhozhesti. [Seed of trees and shrubs. Methods for determination of germination]. Izdatel'stvo standartov, Moscow (in Russian). Kollektsii rasteniy Botanicheskogo sada SFedU: katalog rasteniy, proshedshikh introduktsionnoe ispytanie (2014). [Plant collections of the Botanical Garden SFedU: catalog of plants that underwent introductory testing]. Izdatel'stvo SFedU, Rostov-on-Don (in Russian). Kozlovskiy, B.L., Ogorodnikova, T.K., Kuropyatnikov, M.V. & Fedorinova, O.I. (2010). Ecological and morphological features of spontaneous hybrid Corylus colurna L. and Corylus avellana f. atropurpurea Petz. & Kirchn. The North Caucasus Ecological Herald 6 (2), 64-66. (in Russian). Krasnaya kniga Rostovskoy oblasti (2014). [The Red Book of the Rostov Region]. Minprirody Rostovskoy oblasti, Rostov-on-Don, 2. Rasteniya i griby. (in Russian). Nikolaeva, M.G., Razumova, M.V., & Gladkova, V.N. (1985). Spravochnik po prorashchivaniyu pokoyashchikhsya semyan [A guide to germinating dormant seeds]. Nauka, Leningrad (in Russian). Novosel'tseva, A.I. (1978). Spravochnik po lesosemennomu delu [Handbook on forest seed business]. Lesnaya prom-st', Moscow (in Russian). Ogorodnikov, A.Ya. (1993). Metodika vizual'noy otsenki bioekologicheskikh svoystv drevesnykh rasteniy v naselennykh punktakh stepnoy zony. 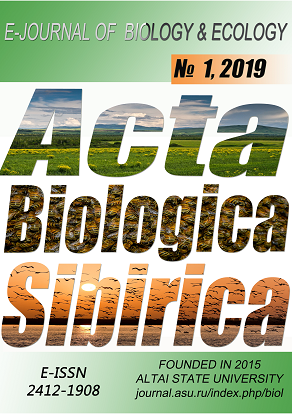 In: Introduktsiya rasteniy [Method of visual assessment of bioecological properties of woody plants in populated areas of the steppe zone. In: Introduction of plants]. Izdatel'stvo Rostovskogo universiteta, Rostov-on-Don, 50-58 (in Russian). Rusanov, F.N. (1950). Novye metody introduktsii rasteniy [New methods of plant introduction]. Bull. Main Botanical Garden of the Academy of Sciences of USSR, Moscow, 7, 27-36 (in Russian). Zamyatnin, B.N. (1958). Klenovye – Aceraceae Lindl. Derev'ya i kustarniki USSR [Maple – Aceraceae Lindl. Trees and shrubs of the USSR]. Publishers of Academy of Sciences of USSR, Moscow & Leningrad, 4, 405-499 (in Russian). Zaytsev, G.N. (1981). Fenologiya drevesnykh rasteniy. [Phenology of woody plants]. Nauka, Moscow, (in Russian).